Any Harry Potter fans out there? Brinley was Dobby the house elf for Halloween. My husband was Hagrid, I was Professor McGonagall, Brayden was Harry Potter, Kaitlyn was Hermione, and McKenna was Ginny Weasley. 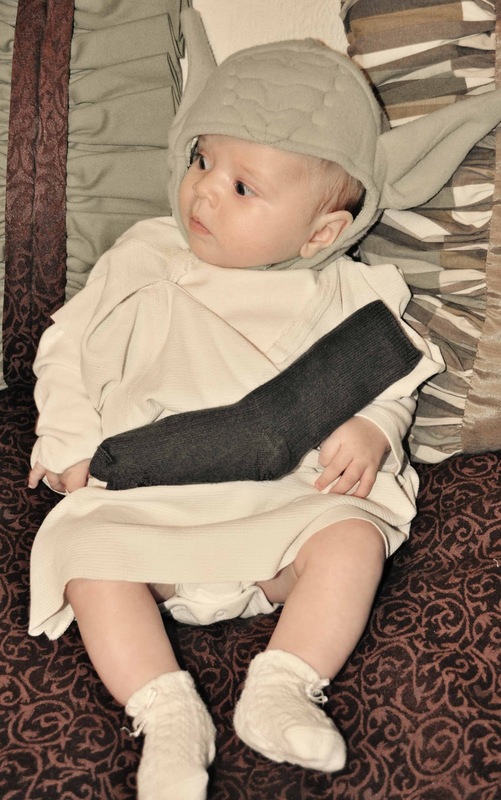 Brinley was going to be a wizard (I guess witch), but my friend Manda had the idea for her to be Dobby. So we ran with it. This is a summary of Brinley’s 13th week–she was 12 weeks old. This is the last of the newborn phase! Oh eating. So this is wonder week 12 week. The most notable thing for me with wonder week 12 is the non-eating that happens. It can be very hard to get baby to eat. We had only one day of this. Then I started lightly keeping my free hand on the back of her head and found she would nurse as normal if I did that. She also refused the bottle again this week. I was helping in Kaitlyn’s class at school and my mom was watching her and she refused the bottle. Later in the week my husband tried to give her one, and she wasn’t so offended as she was with my mom, but she also didn’t really eat. I fear our bottle days might be over. We will keep trying though. Her two favorite toys right now are the activity gym and her bouncer seat. She really, really loves the bouncer seat. She also likes to look at light fixtures if they stick out from the ceiling. She loves the ceiling fan (not moving). She also started having a longer waketime this week. She now does 60 minutes for each waketime length. Sleep was good and normal this week. She had one day where she ate sooner than usual. I guess that was a growth spurt day? I moved her into a larger diaper at night. So in the day she wears size one, but through the night she wears size two. After this wonder week, there is a good chance your baby will be ready or close to ready to drop the swaddle. She is a lot less jerky. So we will try that next week! This is our daily schedule. Remember it was shifted to prepare for the time change. My daughter is a little older than Brinley at 15 weeks and just now sleeping for 1.5 hr to 2hr in-between her 3 hour feedings. HURRAY! However, I have noticed that I need to wake her up from her naps to keep to her 3 hour schedule. If she wakes up herself, before it's time to eat, I have a really hard time nursing her at the 3 hour time. She just smiles up at me, very alert, and pushes away my breast. If I keep trying to latch her on, she starts fussing, turning her head, arching, and pushing my breast away very angrily. Have you had any experience with this? It appears that she will only nurse when she is asleep! I'm really worried that this will impact her eating when going to daycare when she may not nap as well as at home. Daycare is still a month and a half away, but I'm getting nervous. FYI: Our schedule is 7, 10, 1, 4, 7, 10 bottle dream feed, once in the middle of the night between 3-5am with bedtime between 7:30 and 8:00pm.Any words of wisdom would be most welcome!Thanks! My little guy tends to refuse the bottle at times. Especially during growth spurts and wonder weeks. We are now making sure my husband gives him one bottle a day so he doesn't forget how to use it. I go back to work when he is 18 weeks, and I am so afraid he will not consistently take a bottle. Friends have told me that their babies have gone 12 to 15 hours before finally taking a bottle, and some never would. My first son loved the bottle and quit breastfeeding on his own at 14 weeks. This one loves to breastfeed and is very attached to mommy:) funny how they are all so different. I want to see a picture of your Halloween costumes! Sounds darling. I do love the Dobby one. My little man is 10 weeks old tomorrow and just today he has started not really wanting to eat much. He normally eats 6oz (he's bottle fed) and he's a GREAT eater but now hes starting to only want a few oz and then he just starts fussing? I know his age doesn't line up with a wonder week- do you think it could still be? Any suggestions? Thank you!!! My little boy, Z is 1 week older than Brinley. I almost died of exhaustion as last week (13) he went through 3 days of growth spurts! His intake of expressed breastmilk went up to 160ml. After 4 days, it finally went back to his normal 120ml of milk. *Phew*Can i ask when will you will be moving your daughter to a 4 hour routine? Mine is now currently alternating 3 hours to 3.5hrs. Is good because there were hit and misses like he woke up earlier from his nap or his night sleep. Then i will readjust to reach my desired timing. Thanks! Funny, my son is also 13 weeks and our schedule is almost the exact same as yours! The thing I'm nervous about is how to start getting them to take naps or go down for bed Without swaddling and binky. As long as I swaddle him and give him his binky, he falls asleep within a few minutes with no further help. Even if he wakes from a nap cause his binky fell out, if I let him whine for 3-5 minutes, he'll fall right back to sleep. But the few times that I have tried to put him to sleep without one of those two things, it is Impossible!! He will absolutely not sleep without them no matter how exhausted he is! (Unless he is in the carseat, then he doesn't need the swaddling. Just wondering if you had any thoughts on that. Thanks! About the bottle refusal – you may have already experienced this but I found my daughter Maren did not like to take bottles from other women. She was fine taking them from men, though. I don't think she understood that she couldn't have food from the "source" from just anyone with breasts. Hello again!My daughter will be 12 months on Friday and is waking up around 330am every morning for a feeding. The last few nights we didn't wake her up after her 500pm feeding but still gave her a dreamfeed at 1000pm and she still wakes up at pretty much exactly 330am. I know she needs the 6 feedings but the fact she gets up at the same time no matter if she has that feeding or not makes me think its habit. When she is up she eats for about 5 min a side at this time. Sometimes she can go to 715am after that feeding but lately she's been waking up at 600am and not even that hungry. My questions are these-when she wakes, do I force a full feeding because she's still only waking up at 600am or give her a little to wean her? Should I ensure she always has an early evening feed (700-800pm) and the dreamfeed? We're move back to the US from Germany in 2 weeks-a 9 hour time change-so I'm trying to get more consolidated sleep before that. After she gets used to the new time, we'll probably remove the swaddle. Any help would be appreciated! Thanks so much, as always! Sorry, I meant to say my daughter is 12 weeks, not 20 weeks! Thank you! Hi! My little girl is te days shy of 12 weeks. For the past week or so she has been taking shorter naps. She usedto go 1 1/2 hours to even 2 hours (other than when she went through the 45 minute intruder phase). Now she naps for exactly one hour. This obviously messes up the three hour schedule since but awake time is usually 50 minutes including feeding. I usually looked her CIO but it eventually gets to the point where I just give in, usually 15-20 minutes. Should I keep letting Jr cry? Or does she just not need that long of a nap? She does sleep 10-12 (usually 12) hours at night with two feedings. Hi, my twin girls are 12 weeks and we have been following babywise since they were home from the hospital. They seem to be on a pretty good schedule (similar to the one you are on with Brinley) and our only issue is that when we put them down at 8 and after the dreamfeed (for us is at 11 pm, not sure why we do it that late) they sleep great until random times throughout the night and then wakeup and fuss, cry, just make all kinds of noises. Sometimes it's at 2 am, 4:30 am, 6 am, etc. Is there a reason why they won't sleep solidly from 8-8 with just a dreamfeed in the middle? They've done it maybe a handful of times but most of the time they wake up, we don't go in there but can hear them on the monitor…Any advice or thoughts would be so helpful!